We are thrilled to announce the launch of our new resource called “Managing Food Allergies and Anaphylaxis: A Guide for Post-Secondary Institutions”. This comprehensive guide equips universities and colleges with critical information and resources to help them create a more allergy-friendly campus environment. 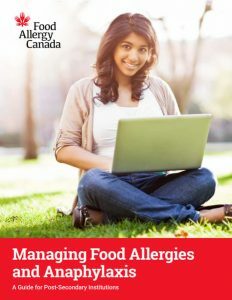 To support the launch of this guide, we created a new section on our website, foodallergycanada.ca/campusguide. There you will find other elements related to the guide, including a food allergy management quiz for institutions to assess how they currently manage food allergies on campus, a fun video that outlines the benefits of the guide, and other resources and tools for institutions and students. We also include a personal dedication to Andrea Mariano, as she is the inspiration behind our work with campuses. Andrea suffered a fatal allergic reaction on campus in 2015 and her death highlighted the need to take a closer look at the management of food allergies and anaphylaxis in campus environments. Since that time, we have collaborated with over 75 stakeholders to develop this comprehensive new resource – the first of its kind in Canada. This launch is only the start of our commitment to our post-secondary initiative. As youth with food allergies are a high-risk audience for serious reactions, we are continuing to develop a comprehensive strategy to enable teens and young adults to better manage their allergies with the support of their communities. Help support this launch! Share the news with others using the hashtag #SupportingU. If you or your child is attending a post-secondary institution, please share the guide with your campus. Stay tuned for more details in the coming months on how you can support allergy-awareness on campuses. Check out our video for a quick overview of the guide!